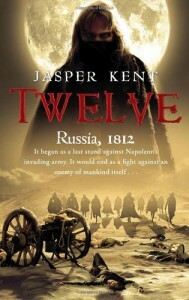 Caveat emptor: I picked this off the New Books shelf at one of my libraries because it sounded intriguing – a desperate group of Russian officers recruits a band of voordalak (vampires) to help defeat Napoleon’s Grande Armée only to realize that Bonaparte is the least of their worries. The idea is still intriguing and it might make a good novel but this isn’t it. “‘Perhaps you should tell us what makes them so remarkable,’ said Vadim. Vadim and I both nodded agreement, but Maks, surprisingly, had not come across the term. Don’t waste your time with this one.